An everyday 007 watch, which features an analogue display, a radio transmitter and a digital message system that runs across the top. It’s all a set up of course, for Margaret Thatcher to talk to a parrot. It was however a simple but effective James Bond style gadget. Merging two existing technologies together to create a new one that may even sell to the general public follows on in a fine Q Branch tradition. 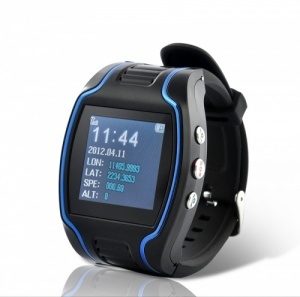 Just send a text message to this GPS Tracker mobile phone wrist watch and it will reply with the exact coordinates of its location, which is great for keeping an eye on your children or elderly relatives. Once you receive the coordinates just type them in on Google maps on your laptop computer and you'll be able to see exactly with pinpoint accuracy the location of the tracking device.